Examiner of Mathematics (Edexcel, AQA & OCR). I specialize in teaching Mathematics and Physics from key stage 2 to 5 and up to a Degree level. I possess a mature and constructive eclectic teaching approach with excellent ability to communicate and have effective working relationships between students and parents. I am a confident and hard working individual. I enjoy using my own initiative in all aspects of academic work, but above all, what inspires me the most, is the satisfaction of getting positive results from my students. 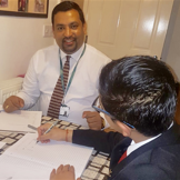 I am aware that students and parents are crucial to a responsive student attitude and therefore I am very passionate about building a successful learning environment and meeting the needs of student. I am determined to continue my significant contribution to my profession Academic Year: 2016 -2017 Result. Further Maths: 12 students achieved `A*'. Core Maths: 14 students achieved A* & A. 6 students passed their UKCAT, MAT, BMAT, GRE,GMAT and SAT (USA).